An essay by Christopher Fleet (National Library of Scotland) and Charles W J Withers (University of Edinburgh). 'The Cadastral, or, to use the more familiar name, the Ordnance Survey of the United Kingdom, is one of the most remarkable and complete works of the kind that has been undertaken; and it will always be regarded as one of the most valuable acts of practical government that has been carried out in this country.' – (Wilson, 1891, p.248). The mapping work and history of the Ordnance Survey – 'remarkable' certainly but in its continued revision never 'complete' –is well documented for England and Wales and especially for Ireland whose 'paper landscape' has been much studied (Andrews, 1975; Close 1926; Seymour, 1973). 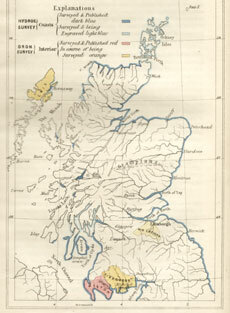 Scotland by contrast has been less well served, both in terms of the maps produced by Ordnance Survey and in regard to the historical study of the Survey itself. This essay offers an outline history of the Survey's work in Scotland as an accompaniment to the Library's digital display of the Survey's six-inch series maps of Scotland produced between 1843 and 1882. The origins of the Ordnance Survey are summarised. In sections on triangulation, different scales, map content, place names, surveying practices, map production methods and the wider context in which the Survey worked, what follows shows how Scotland's real geography was turned into a 'paper landscape'. For those readers who want to explore this history further, a list of references and further reading is given at the end. The crucial foundation for what became Ordnance Survey was arguably the Military Survey of Scotland, which mapped the Scottish mainland between 1747 and 1755 in response to the Jacobite uprising of 1745-1746. This was the first government-funded survey of a large part of Great Britain, by teams of military engineers (in the Board of Ordnance) using trigonometry, and under the superintendence of William Roy (1726-1790), who subsequently repeatedly agitated for an official survey of Britain. In 1783-1784, William Roy, by this time Major-General, oversaw the connection by triangulation of the Royal Observatories in London and Paris, a significant astronomic and cartographic achievement. After Roy's death, the outbreak of hostilities with France in 1793 created renewed pressures for a national survey, which was duly authorised, beginning with the south coast and extending northwards. The official founding date of Ordnance Survey, at this time termed the Trigonometrical Survey, is often taken as 1791, the year in which an improved theodolite by the instrument maker Jesse Ramsden was purchased, and its first executive officers appointed. Initially, England and Ireland were both higher priorities for the new Trigonometrical Survey, the former from military and defensive concerns owing to the Napoleonic Wars, the latter due to the need to reform an inequitable land tax. As a result, Scotland had to wait over 30 years before some limited mapping was undertaken, and over 80 years before the whole country was surveyed. From 1819-1828, closely following earlier triangulation work, three Scottish counties (Ayrshire, Wigtownshire, and part of Kirkcudbrightshire) were the first to be mapped, but the plans were aborted, the work was never engraved, and no drawings or field note books have survived. After 1824, with the southern half of England mapped at the one-inch to the mile scale (1:63,360), the Survey's attentions shifted to Ireland, which for valuation purposes was mapped at the more detailed six-inch to the mile scale (1:10,560). It was not until 1838-1841 that work resumed in Scotland to complete the primary triangulation, and not until 1843 that surveying commenced in Wigtownshire. The uneven pace of survey in Scotland is marked by moments when people sought to do something about it. In 1836, for example, the British Association for the Advancement of Science – under the direction of its Chairman the Tarradale-born geologist Roderick Impey Murchison (1792-1871) – petitioned the Trigonometrical Survey over the regrettable state of the Survey. In 1837, representation was again made about the Survey's uneven progress from the Royal Society of Edinburgh, the Highland and Agricultural Society of Scotland and several other civic and learned bodies. As Thomas Colby (1784-1852), one-time Superintendent and then Director of the Ordnance Survey put it at the time, 'The Scotch are coming forward for their Survey in good earnest. The Societies have petitioned, and some influential men see the Chancellor of the Exchequer to-morrow about it. A more powerful mass of noblemen and gentlemen are coming forward on that point' (cited in Close, 1969 edition, p.92). As the eminent Scottish cartographer and geographer Alexander Keith Johnston (1804-1871) was to note even as late as 1851, 'A very general feeling exists in the public mind that, in this matter, Scotland has experienced most unmerited neglect, and since the expectation of immediate progress, occasioned by the fact that the Ordnance surveyors have occupied the ground, is doomed to certain disappointment if things are allowed to continue as they are, it is to be hoped that means may at once be devised for ensuring a more satisfactory result' (Johnston, 1851, p. 9). Mapping the nation, it was felt, was paramount for good science and the public good and would put Britain and Scotland on a par with other nations then more advanced in 'this branch of geographical science'. OS maps surveyed and drawn, 1861. Although the plan had been to proceed generally northwards, Sir James Matheson, the proprietor of Lewis, was able to persuade the Survey that areas in Scotland requiring agricultural improvement should be given priority. From 1847-1853, the island of Lewis was mapped, with Matheson paying the extra expenses of being mapped out of sequence, and agreeing to purchase 100 copies of the maps. For well over a decade, progress was also delayed and diverted by disputes over the choice of scale (the famous 'Battle of the Scales'), and it was not until 1859 that most of the Scottish Lowlands were complete. The Survey's work in Scotland was often hindered by having too few men and limited funds. Where the total sums available for the period 1819-1838 had been a fraction over £5,000 for example, the sum available for the one working year of 1845-1846 was £10,000. But only £6,000 or so of the funds available was spent because staff were too few. In 1846-1847 to take just one year as illustration, there were no Survey officers at all at work in the Outer Isles and only two sappers [see note 1], one surveyor and 11 labourers. But the situation did improve. By 1856, there were only six Survey officers at work across Scotland, but they had 204 sappers, 416 civil assistants and 300 labourers at their disposal. By 1869, most of Scotland as far as the Great Glen had been surveyed, with work in Highland districts delayed not only by the terrain and by snow – and not just in the winter months – but also by the proprietors of deer forests objecting to survey work between July and October. With the completion of the field survey of Orkney and Shetland in 1877, and the final publication of the maps by 1882, the six-inch mapping of Scotland was finally completed. 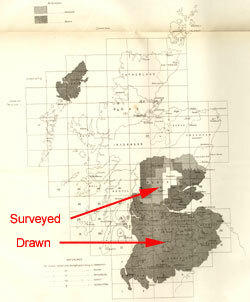 View list of Scottish counties, with their dates of survey and publication. Lower paid privates in the Corps of Royal Engineers. Before 1856, such men formed the Corps of Royal Sappers and Miners, subsequently amalgamated into the Royal Engineers.